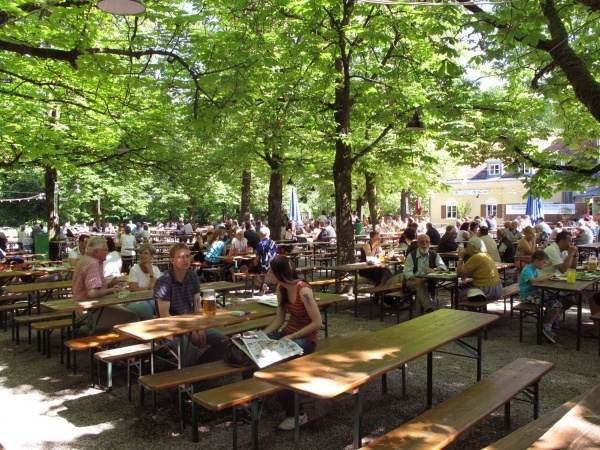 The large and popular Waldheim (“forest home”) beer garden is located just at the forest edge of Fürstenrieder Wald in the Großhadern district of Munich. The over 100 years old beer garden has a very traditional character with about 2,500 seats under large chestnut trees. The food stalls in the self serviced area offer warm and cold Bavarian meals as well as a salad and pasta bar. A Maß Hacker-Pschorr Hell (lager) costs €7.70 (June 2017). Major football tournaments are shown live on a big screen in the beer garden if the weather is good. A large beautiful ballroom in the main building for up to 280 guests as a well as a lounge can be rented for special functions. Additionally, there is a “partybox” which offers your own private beer garden in a wooden fenced enclosure with up to 100 seats. Drinks must be ordered via the beer garden and it possible to buy an entire barrel of beer. Home made food can be brought or alternatively bought at the food stall in the self serviced area. A large grill can also be rented for a private BBQ party. In case of bad weather, a party tent will be set up. The beer garden is open daily from 10.30am until 10.30pm during warm months. The season usually lasts from April/May until the end of October depending on the weather, so if for example the weather is warm already in March, Waldheim will open earlier.